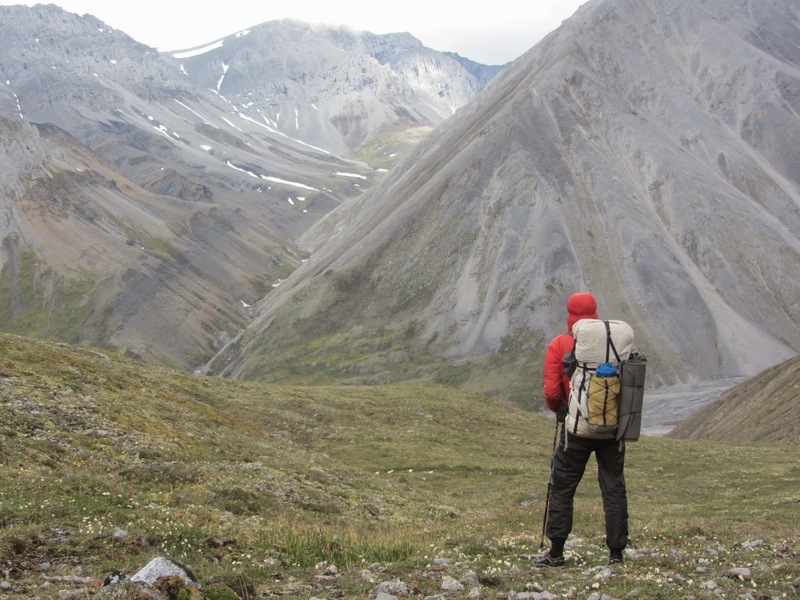 Here you will find some more or less regular progress reports for my solo hike along the crest of Brooks Range Alaska, in July 2014. This posting will be updated by my wife Ann, with reports received via satellite phone. I will try to make daily contact, but that will probably not always work. You will find more or less the same postings on Facebook, but the postings on the blog here will likely contain some more information. Ann writing: Morning July 4. Jorgen camped at 68.95690N/141.54718W. Flight worked well but GPS-tracker was left in Coldfoot. Not so good but Jörgen is an old fox that can handle maps and compass. Ann writing: Lunch July 5. Jorgen was at 68.98099N/142.10365W. Yesterday (Friday) was tiresome with uphill walking towards Kongakut (a river Jörgen will follow for some days) and a heavy pack. Walked 15 km. Today (Saturday) it’s a nice and warm day. Walks slowly but it’s less to carry for each meal. Ann writing: Evening July 6. Jorgen camped at 68.93403N/142.74010W. Saturday Jorgen walked 15 km. It was hard work but wonderful. The Kongakut valley is like a paradise. Sunday walked 18 km. Easy going on gravel bars. Seem to have started to get used to walking. It is warm, 25 degrees Celsius. Ann writing: Evening July 7. Camped at 68.88461N/143.20569W. Everything is fine. The sun is shining. Found some shade for lunch. No mosquitos. Walked 21 km and Jörgen is very pleased. He is now on schedule and loves it. Ann writing: Evening July 8. Camped at 68.82568N/143.54996W. Walked 14 km. He is still on schedule. Forded Sheenjek River, which was fairly easy to do. He will go south of Double Mtn. Jörgen is a bit irritated at me because he doesn’t get my answers to his satellite phone but he will have to live with that I’m afraid. Technical problem. Ann writing: Wednesday lunch time July 9. 68.77746N/143.67073W. On Google Earth you can see some nice pics from this area. Not taken by Jörgen, but anyway. Not received any location for evening camp, but he says west of Double mtn. A large herd of caribou has passed by. Around 1 000 animals. Walked 20 km during Wednesday. I don’t know why he has chosen this route but it might be that it’s easier to navigate without having a GPS. He was supposed to take a route north of Double mtn. Ann writing: Thursday evening July 10. 68.89111N/144.27527W. He has now reached The East Fork of the Chandalar river and says he’s on schedule. Walked 20 km today and actually met two other human beings. Unbeliveable. I will say thank you to Martin Nordesjö and Jonas Hållén who have helped him with finding coordinates for a pass further on. Thank you so much. It eases my heart and will help Jörgen to find his way. Also thanks to Daniel (our youngest son) that checks my writing. Ann and Daniel writing: Friday evening July 11. 68.97431N/144.63922W. Walked 22 km today and passed Guilbeau Pass at lunchtime. It was difficult finding a route due to gorges. Passing scree areas was also an experience. Scree areas are obviously difficult to climb due to how the gravel shoots you back down. Jörgen follows his planned route and schedule. Ann and Daniel writing: Saturday evening July 12. No position. Walked 18 km. It has been raining all night and day. The ground is rough, boggy and soggy. He might have some trouble with his shoes because he asks for shoes and duct tape in the cache. Tomorrow is a high altitude pass. Ann and Daniel writing: Sunday evening July 13. 68.86848N/144.99023W. Walked 15 km. It has been the hardest day so far. It was difficult to find the way through the pass. He made it but came out further to the south than planned. No problems though, he will follow Red Sheep Creek or Cane Creek to his cache at Canning River. Ann and Daniel writing: Monday evening July 14. 68.79317N/145.26695W. Walked 16 km. It has been raining all night and day. Jörgen is camping on a very beautiful spot. I’m looking forward to seeing the photos. He has seen his first bear on this trip but it was far away. Ann and Daniel writing: Tuesday evening July 15. Position from lunchtime 68.79849N/145.40685W. Walked 13 km. He has had difficulties with one or more gorges. The Spot Messenger is broken, so there will be no position information until he reaches the cache, which he will do tomorrow. I think also his camera and compass is in need of replacement. I hope to have more information about that tomorrow. Ann and Daniel writing: Thursday lunch July 17. Jörgen has reached the cache. Everything is fine. Tomorrow he will rest. The reason for so many broken things is that the backpack rolled down a steep hill. He has what he needs in the cache except for a camera. Ann and Daniel writing: Thursday evening July 17 still at Canning River. He has used the day for washing, sorting and resting. Dirk and Danielle from Coyote Air were there with some friends. Jörgen took the opportunity to discuss the route with Dirk. Jörgen will now take a route that is further to the north than planned. The route is on lower elevation which will make it easier. Ann and Daniel writing: Friday evening July 18. Evening position close to Porcupine Lake. He is still following his planned route and saying that it will be easy doesn’t quite fit the description. Todays 15 km have been the worst for the legs so far. Heavy pack again, steep hill and walking in tussocks all day. With tussocks you have three choices. 1) Jumping from one tussock to the next. Speedy but dangerous. 2) Walking around them. Will be many extra steps but safe. 3) Following a straight line stepping up and down. Hard for the legs. He is very pleased with his mosquito net. Says it would have been impossible without it. Knowing that Jörgen has a very high tolerance for mosquitos I guess most of us would have found it insufferable. Ann and Daniel writing: Saturday evening July 19. 68 44 44.9N, 146 50 15.3W He is now following the Ivishak River. Walked 18 km today and feeling many years younger than yesterday. Less tussock today. Ann and Daniel writing: Sunday lunch July 20. 68 42 50.6N, 146 57 45.7W Walked 18 km today (no position for evening). It was heavy rain during night but not so much during the day. He has walked a canyon with a creek he has crossed many times today. He is now walking north from his planned route and will have a pass tomorrow. He has got GPS positions from Dirk and also borrowed a map because this route is not covered by his maps. Ann and Daniel writing: Monday evening July 21. 68 40 56.4N, 147 38 48.7W Walked 22 km over a low pass at 1 500 m. Nice but convoluted. Jörgen camps at Ribdon River, which is a dry river at this spot. He will follow the river for some days. Ann and Daniel writing: Tuesday evening July 22. 68 38 38.8N, 148 00 12.2W Walked only 16 km today because of a broken waist belt that needed to be mended. It has been raining all day so he had lunch in the tent. There are many pictures on google earth from this area. Ann and Daniel writing: Wednesday evening July 23. 68 38 22.7N, 148 34 34.8W Walked 24 km along Ribdon River to Elusive Lake and after that over a pass to the south. It was a tough way to end the day and after that there was a brief rainstorm. You call that a vacation? We are curious about what route he will follow the next couple of days. Expects a chilly night, there is some snow on the tent. 4 degrees Celsius compared to 30 in Stockholm. Ann and Daniel writing: Friday evening July 25. 68 31 38.1N, 149 00 34.0W Walked 14 km. It has been a hard day with 8 to 10 km of tussocks hidden by 20 cm snow. At the end of the day he crossed the Sag River and the Atigun River. Reached the pipline and Dalton Highway 11.21 local time. So are photos, trip report etc. forthcoming? Or are they already posted -- but I can't find them?